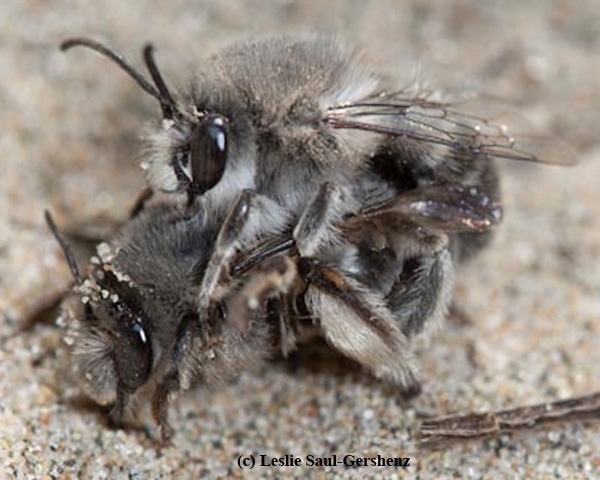 Remember those "long lost" silver digger bees found last week at the San Francisco Presidio? They hadn't been seen in large aggregations for nearly a century. And yet there they were in the newly restored sand dunes at the Presidio, a former military post now owned and operated by the National Park Service. 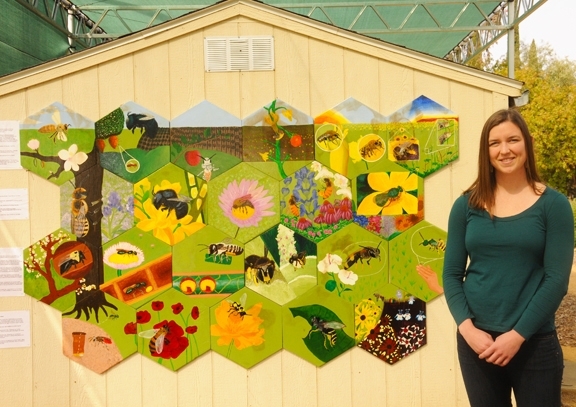 UC Davis entomologist Leslie Saul-Gershenz lent her expertise when a volunteer discovered the thriving colonies of bees. An authority on digger bees, she confirmed that they are Habropoda miserabilis and were probably common in the sandy dunes of that area as late as the 1920s. 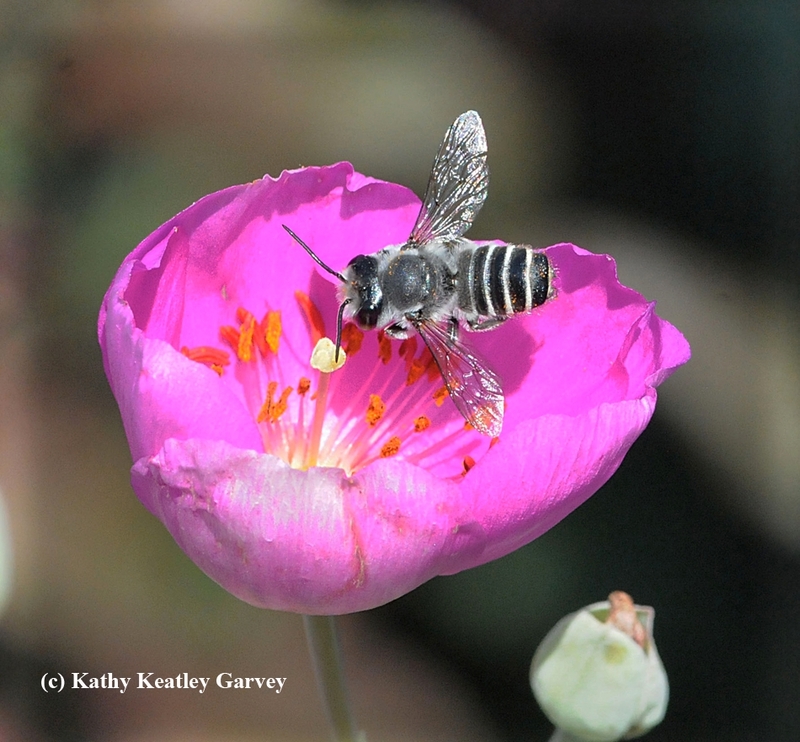 When non-native ivy, eucalyptus and ice plants took over their habitat, the bees disappeared. “I am very happy to see this nest site at the Presidio,” she said. 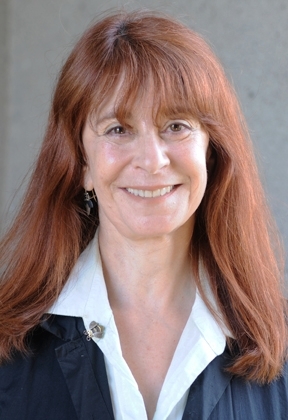 She's worked on the biology, chemical ecology and parasite interactions of this group of bees in the genus Habropoda for many years--on research trips that have taken her to the Oregon coast and the Mojave desert, among others. 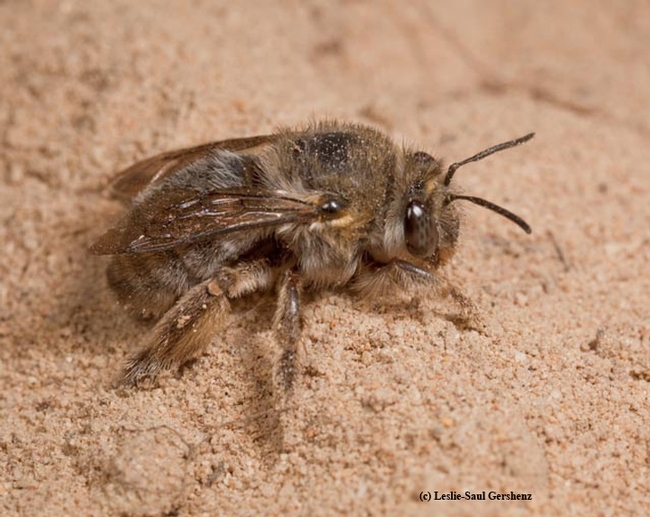 In a news story published in the San Francisco Chronicle on March 29, science reporter Peter Fimrite quoted the UC Davis entomologist as saying that the silver digger bees were “all but gone” by the mid-20th century. However, Saul-Gershenz has kept looking for them. In fact, she collected one near Baker Beach in 1998. 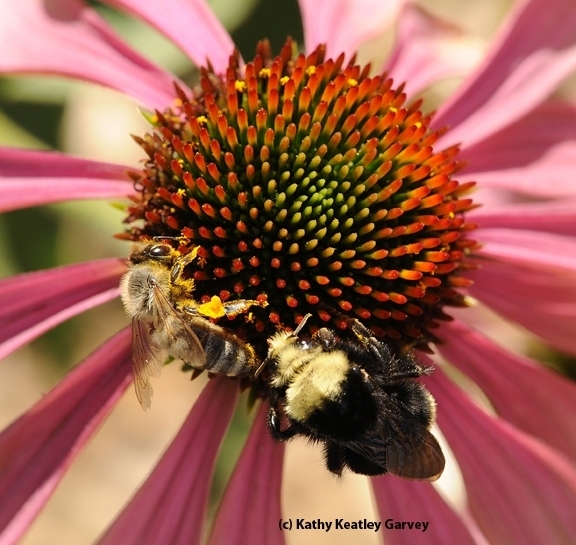 With restoration, comes hope for the return of native plants and insects. Brian Hildebidle, stewardship coordinator for the Presidio Trust, discovered the colonies while surveying a dune restoration project. Jonathan Young, wildlife ecologist for the Presidio Trust, was also included in the news story. 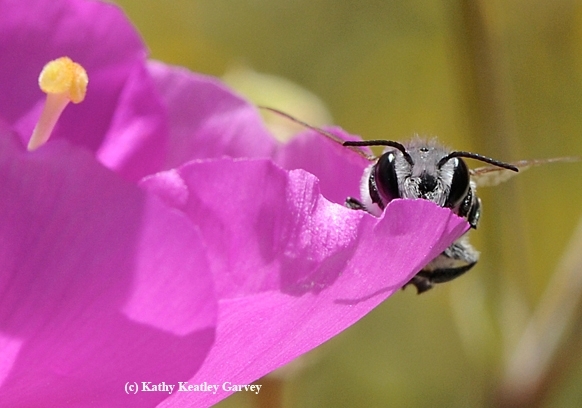 The comeback of silver digger bees is not limited to San Francisco. Fimrite related that several other areas in California are are witnessing comebacks, including Bodega Marine Reserve in Bodega Bay and Lanphere Dunes in the Humboldt Bay National Wildlife Refuge. We remember seeing volunteers at Dillon's Beach, Bodega Bay, last summer removing ice plants by the bird sanctuary, and in the process, giving native plants, native insects and related wildlife a chance to thrive. We remember beachcombers asking "Why? Why are they doing that? Those ice plants are so PRETTY." The discovery at the Presidio is why. As Saul-Gershenz points out, there are 1600 native bee species in California, but scientists know little about many of them. They are all pollinators. And all life is connected. As naturalist/environmental philosopher John Muir (1838-1914) wrote in My First Summer in the Sierra: "When we try to pick out anything by itself, we find it hitched to everything else in the Universe." So it is with the silver digger bees. That's why they're gold. If you want to learn about native bees, the place to "bee" on Saturday, Jan. 7 is the Rush Ranch Nature Center, 3521 Grizzly Island Road, Suisun. 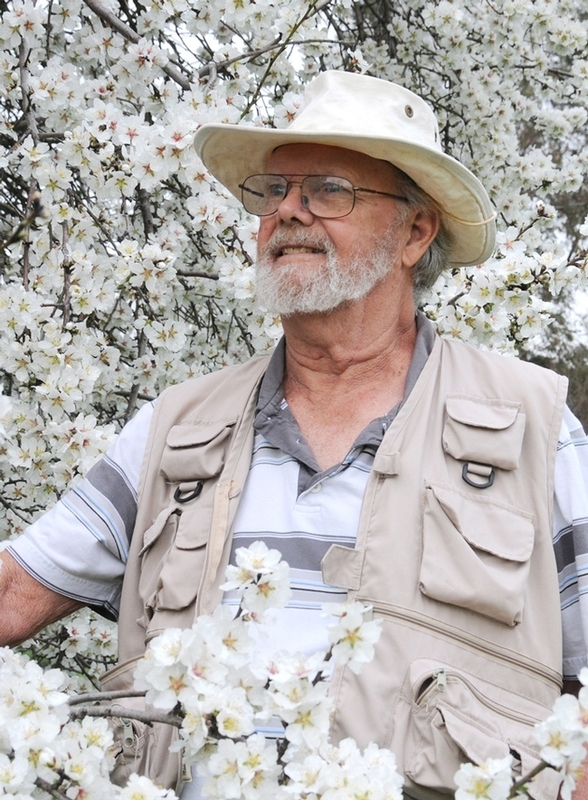 That's when native pollinator specialist Robbin Thorp, UC Davis distinguished emeritus professor of entomology, will address the crowd, sharing his encyclopedia-like knowledge and answering questions. 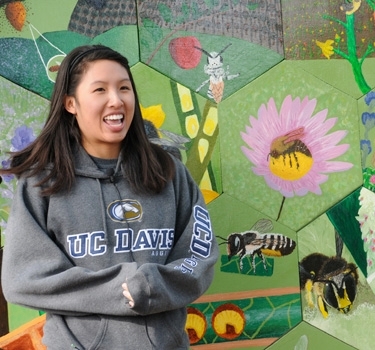 The two-hour program, "Bee Aware Bee Cause," begins at 1:30. Free and open to the public, the program is sponsored by the Rush Ranch Educational Council, in partnership with Solano Land Trust, owner of Rush Ranch. It will be held "rain or shine," a spokesperson said. 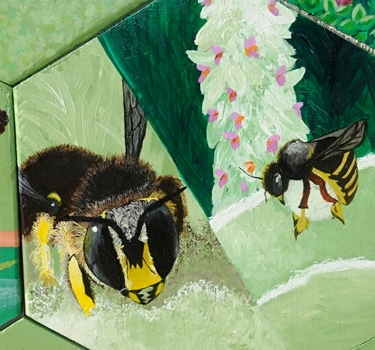 How much do you know about bees? You probably know that the honey bee is not native to this country. European colonists brought it over here in 1622 to the Jamestown colony. But how about the thousands of other bees? How many undomesticated bee species are there in the world? 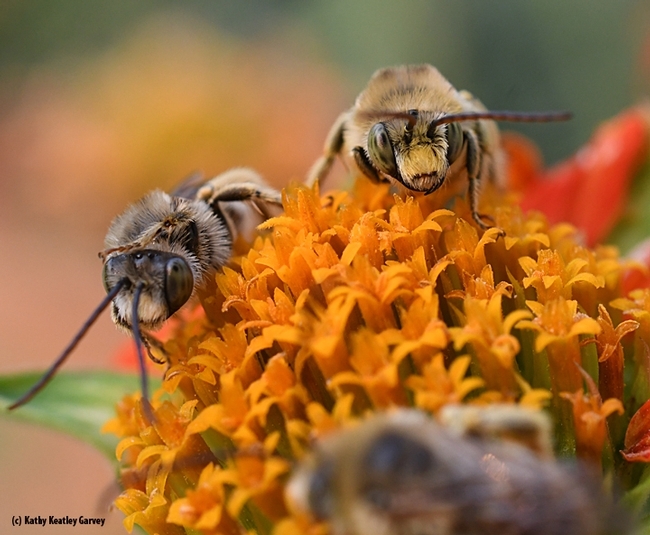 How many bee species live in the United States? 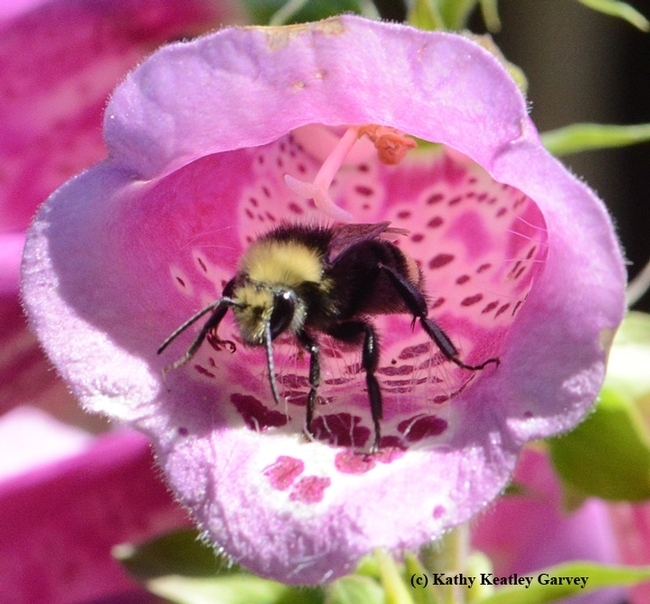 How many bee species live in California? "Robbin Thorp" and "bees" are synonymous. 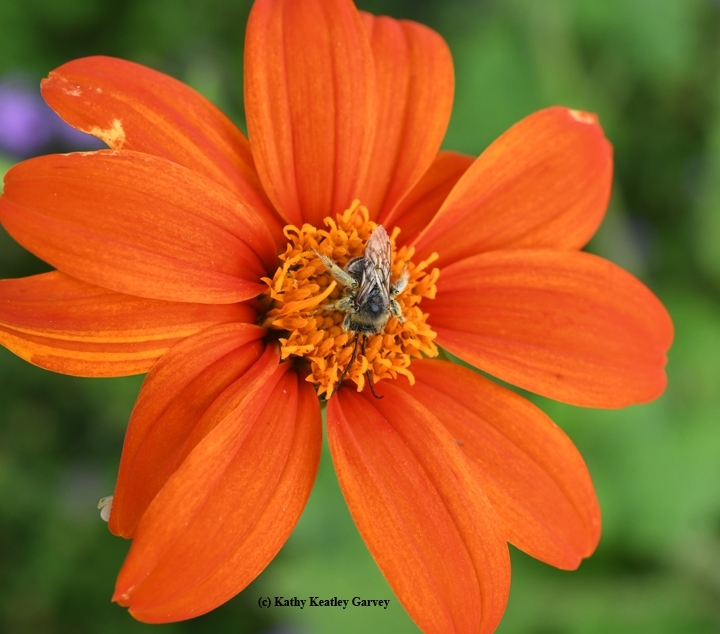 Internationally recognized for his expertise, he co-authored the UC California book, California Bees and Blooms: A Guide for Gardeners and Naturalists (Heyday) and Bumble Bees of North America: An Identification Guide (Princeton University Press). Thorp annually teaches at The Bee Course (American Museum of Natural History), at the Southwestern Research Station, Portal, Ariz. 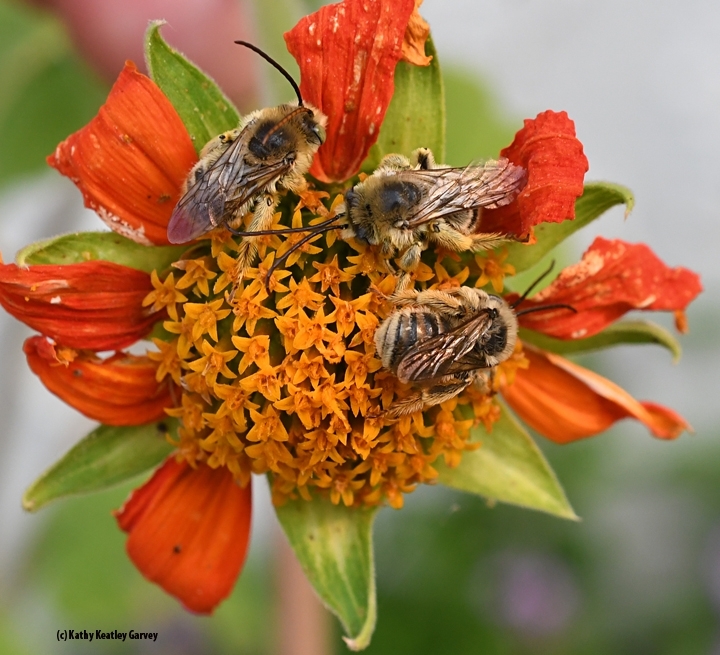 The two-week course is offered for conservation biologists, pollination ecologists and other biologists who want to gain greater knowledge of the systematics and biology of bees. Thorp, who holds a doctorate in entomology from UC Berkeley, taught entomology at UC Davis from 1964 to 1994. Although emeritus since 1994, he continues his research, writings, bee identification, public outreach and other "bee-involved" activities from his headquarters in the Harry H. Laidlaw Jr. Honey Bee Research Facility at UC Davis. CNN recently featured him in a piece it titled "The Old Man and the Bee," about his dedicated drive to find the critically imperiled (and feared extinct) Franklin's bumble bee within its five-county range of southern Oregon and northern California. 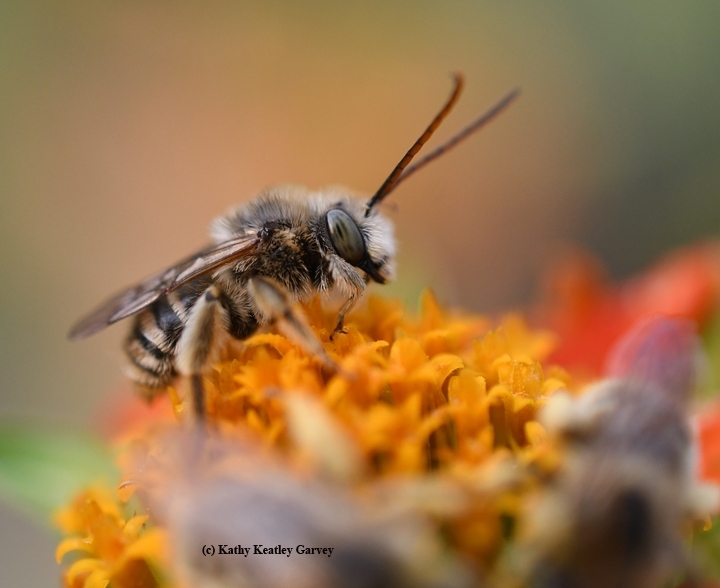 Thorp last saw the bumble bee, Bombus franklini, on Aug. 9, 2006 in a meadow near Mt. Ashland, Ore.
During his talk, Thorp will discuss how to attract bees to your garden and why you should. It's not just honey bees that are declining, scientists say. So are undomesticated bees, due to pesticides, diseases, malnutrition, habitat destruction/fragmentation, global climate change, drought and other extreme weather events. The mission of the Rush Ranch Educational Council, a non-profit organization, is to increase awareness, understanding and appreciation for Rush Ranch and the Suisun Marsh by providing free educational programs and events. 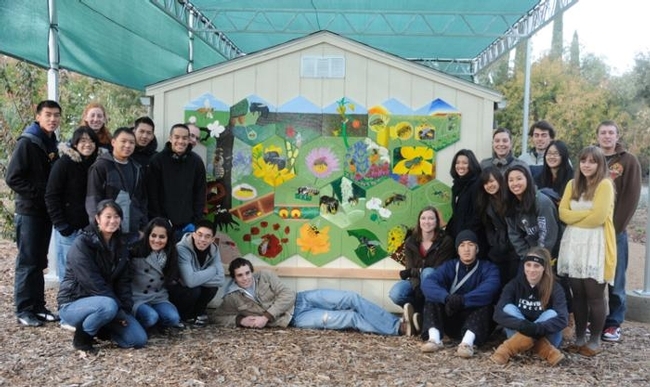 For more information on the Rush Ranch program, including directions, visit www.solanolandtrust.org or call (707) 422-4491.